Are You Subscribed to ANS Published-Ahead-of-Print Alerts? If not, visit the ANS Published-Ahead-of-Print page and sign up! We are now posting articles online as they are available, providing ANS readers the very latest content leading scholarly discourse in nursing! These papers can be cited using the date of access and the unique DOI number. Any final changes in manuscripts will be made at the time of print publication and will be reflected in the final electronic version of the issue. Here is the line-up just posted today! The “As-If” World of Nursing Practice: Nurses, Marketing, and Decision Making. Grundy, Quinn; Malone, Ruth E.
Returning to the Profession’s Roots: Social Justice in Nursing Education for the 21st Century. Development of Hermes, a New Person-Centered Assessment Tool in Nursing Rehabilitation, Through Action Research. Expert Nurses’ Perceptions of the Relevance of Carper’s Patterns of Knowing to Junior Nurses. Efficacy of the Mantram Repetition Program for Insomnia in Veterans With Posttraumatic Stress Disorder: A Naturalistic Study. Beck, Danielle; Cosco Holt, Lindsay; Burkard, Joseph; Andrews, Taylor; Liu, Lin; Heppner, Pia; Bormann, Jill E.
Decision Making Among Older Adults at the End of Life: A Theoretical Perspective. Romo, Rafael D.; Dawson-Rose, Carol S.; Mayo, Ann M.; Wallhagen, Margaret I. What End-of-Life Care Needs Now: An Emerging Praxis of the Sacred and Subtle. 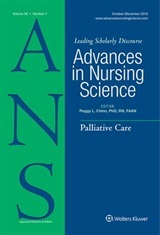 Facing Death: A Critical Analysis of Advance Care Planning in the United States. Sullivan, Suzanne S.; Dickerson, Suzanne S.
An Analysis and Evaluation of the Theory of Unpleasant Symptoms.